Start with the best bread you can get your hands on. A crusty, levain-raised and woodfired bread is my go-to and all the better if it’s made from high-quality locally sourced and organic grains. Look for a bread that has a medium-dense chewy crumb rather than one with tons of holes in it. Each slice needs to be able to provide the structure for your toppings – the last thing you want is to lose them all through a hole in the bread on the first bite. In terms of toppings, knowing how to keep things simple is key for this recipe. Let the garden or the farmers’ market be your guide. Start with the best produce you can get. Think crunchy lemon cucumber slices on a smear of garlicky hummus, lightly sprinkled with smoked salt, or vine-ripened tomatoes, herb-laced ricotta and chipotle flakes. A great tartine should consist of around four ingredients. 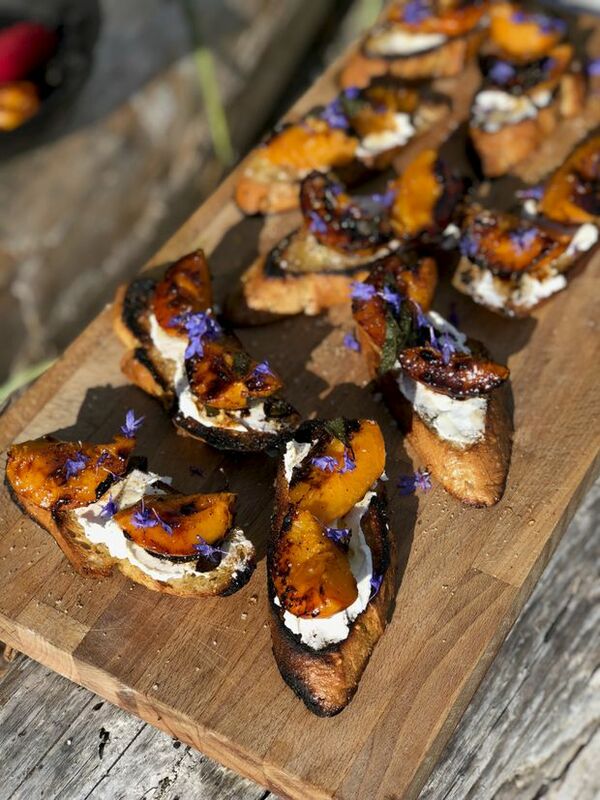 For me, burnt apricots, fresh goat cheese, black pepper and local honey is a current favourite combination. I whipped up a batch of these over an open fire a couple weeks ago and they were the stuff that summer food dreams are made of. At home, they can easily be cooked in a hot cast-iron pan on the stove or even on the barbecue. Try to find apricots that are ripe and tasty. If possible, test a sample before buying as it can be hard to tell what you are going to get with apricots until you actually cut into one. If tasting isn’t possible, look for deep orange apricots with a floral fragrance and dense, plump flesh. They should be firm with a little softness, but definitely not squishy, or else they will be overripe. Burning food may seem like going against all the rules, but trust me, for this recipe and the flavour it creates, taking these apricots a little too far is totally worth it. Fold the goat cheese and pepper together in a bowl until just combined. Taste and add a pinch of salt if necessary. Keep in the fridge until ready to use. Can be made a day in advance. Mix the apricots, brown sugar, cinnamon and salt and 6 grinds of black pepper. Allow to marinate at room temperature for a couple hours. Heat a cast-iron pan on high until it is smoking. Carefully place the apricots cut-side down in the pan. Allow to cook until the sugar caramelizes darkly and each apricot begins to blacken. It will be a bit smokey. Keep an eye on them, using a small spatula to lift up and peek under a few pieces as they cook so as to check the progress. Cook them longer than you think you should, but not so far that they end up scorched to the point of inedible. They should be well-blackened but still glossy from the caramelization of the sugar. Remove from the pan and set aside until ready to assemble. Heat oven broiler on high. Brush both sides of each slice of baguette with olive oil and season with sea salt. Toast each side under the broiler for approximately 1 minute or until toasted. Spread a nice layer of the black pepper goat cheese on each piece of toasted bread. Cut each apricot half in half again and place two quartered apricot pieces on each tartine. Arrange the tartines on a wood board or platter and drizzle with honey and garnish with edible flower petals. Serve immediately.